• new features "A2DP" music sharing, "VOX" and "Vocal Reply"
Top performance, perfect integration in the helmet, excellent audio quality. Sharing the Experience. Stay in touch with your travelling companions: new conference call functions "Smart Conference" and "Universal Conference". sharing A2DP music and phone calls. Guaranteed visibility thanks to the exclusive LED system that signals your preference and lights up when braking. B901L, the highest performance, the safety of an incorporated intercom. • VOX: voice activation and deactivation of intercom. • Automatic exclusion of intercom and of the connected audio source during a telephone conversation. Automatic re-connection at the end of the call. • Storing of 3 favorite numbers, with speed dialing command. • iPhone™ and Android™ Compatible. iPhone is a registered trademark of Apple Inc. / Android is a trademark of Google Inc.
• Intermittent light function in case of poor visibility. 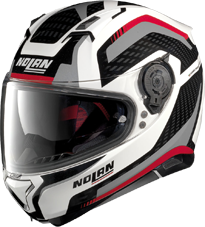 • Purchase a Nolan Helmet and Headset and we will install it for FREE! Limited warranty certificate valid for 2 (two) years from the date of purchase. PLEASE READ CAREFULLY ALL THE CLAUSES AND CONDITIONS OF THIS LIMITED WARRANTY CERTIFICATE. By this LIMITED WARRANTY CERTIFICATE Nolan® guarantee to the original purchaser of the N-Com that  the product is free from all material and manufacturing defects at the time of the purchase. COVER PROVIDED BY THE WARRANTY If any defect covered by this limited warranty certificate comes to light within 2 (two) years from  the date of purchase, Nolan® shall proceed, through their distribution networks and after verifying  the defect, to repair or replace the defective product. Nolan® shall supply all the materials and  provide all of the labor reasonably necessary to remedy the reported defect, except for cases in  which the damage is attributed to one of the reasons listed in the paragraph below, entitled  "Exclusions and limitations of cover". EXCLUSIONS AND LIMITATIONS OF COVER This warranty covers only material and manufacturing defects. Nolan® cannot be held liable for the  damages to the product which are either wholly or partially attributable to any other cause,  including, but not limited to: a) damage caused by improper use, lack of due care, normal wear and tear of internal and external  components; b) scratches, abrasions, or other damage caused to the external parts of the N-Com by  accidental impacts; c) damage caused by the application of stickers and/or adhesives; d) any damage  caused by an accident; e) any modification or change made to the device by the user or by third  parties; f) use of incompatible accessories not sold by Nolan®. 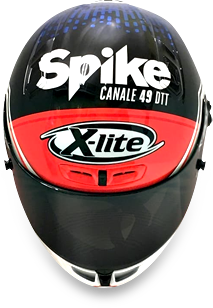 Defects covered by this warranty likewise do not include all the specific and subjective situations  which may arise during dynamic use of the N-Com equipped helmet, such as problems of comfort due to  improper sizing, or wind noise while riding. Nolan® cannot in any case be held liable for  accidental or consequential damage (including with no limitation whatsoever, injuries to a person  or persons) resulting from the failure to comply with the obligations stipulated in this warranty  regarding Nolan® products. Some states do not allow the exclusion or limitation of implied warranties, incidental or  consequential damages, so the above limitations and exclusions may not apply to you. This warranty  gives you specific legal rights, and you may also have other rights which vary from state to state. 1) Identification code (serial number) of the N-Com product. 2) Name of the authorized dealer. 3) Date of purchase of the N-Com product. 4) Name, address and telephone number of the purchaser. PROCEDURE TO BE FOLLOWED TO MAKE POSSIBLE CLAIMS To proceed with any claim covered by this warranty, the purchaser must notify directly Nolan’s  agent in the USA of the alleged defect encountered by him. In agreement with Nolan’s  agent, the  purchaser may have to return the device to which complaints refer, at the purchaser's expense, along  with the sales receipt or other proof of purchase (and date of purchase) and a copy of the warranty  registration form. BEFORE REFFERRING THE MATTER TO THE AGENT, WE ADVISE YOU TO READ CAREFULLY THE USER'S MANUAL  INCLUDED WITH THE DEVICE WHICH MUST BE FOLLOWED SCRUPULOUSLY FOR YOUR OWN PROTECTION AND THAT OF  THIRD PARTIES. 2 (TWO) YEARS AFTER THE DATE OF PURCHASE THIS LIMITED WARRANTY SHALL LAPSE ENTIRELY. This warranty is valid in the entire territory of the United States and Canada and is the only  express warranty given by Nolan® in relation to the sale of their own devices. Any service provided  under the warranty does not have the effect of extending the warranty period itself. If any device  or any of its components are replaced, a new warranty period does not begin to run on the product  or on individual components supplied by way of replacement; the date of purchase of the original  device remains the deciding factor.